Our product range includes a wide range of light batons and safety batons. 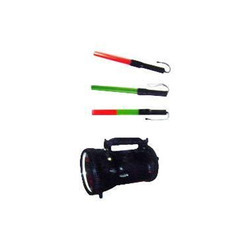 Featuring battery operated functioning, these Light Batons are light in weight and find extensive use among traffic monitoring officials and others. These safety devices are developed from quality ABS material which makes these last long. Further, the support of light provided in batons also makes these suitable to be used for night time monitoring where its blinking LED emits highly signals visible to motorists from far distances. Coming with switching mode for blinking & static light, some of the areas where these are used in include by traffic police, security forces, parking attendants, at construction sites for redirecting traffic and others. 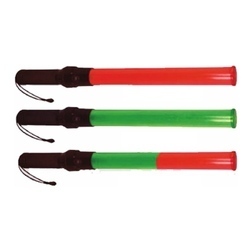 Superior functioning support provided by these light batons also help in reducing accident possibilities. Available in light weight construction finish, these Safety Batons feature use of quality LED’s that provides for bright light for warning motorists as well as for safe guiding of vehicular traffic. Coming in well balanced designs, its torch like hand grip is also weatherproof and provides for continuous usage in blinking mode. With option of also offering these in rechargeable options, these batons allow convenient guidance of traffic even in poor weather conditions. Some of the areas these are used in include in law enforcement agencies, in traffic control applications and others. Further, the use of latest LED technology also provides for longer uptime.